Thousandaire Brunch - Cheshire Moon Inc. 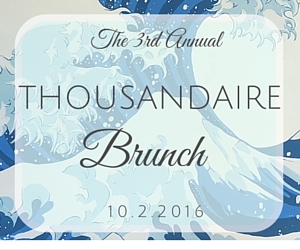 The Thousandaire Brunch is a luncheon event where 100 ticket holders vie for the chance to win a cash grand prize. LA’s best brunch is back — that’s right, the one that helps its guests to walk away with cash and prizes! Gather your friends together to walk the red carpet, dine on fabulous food and cocktails, support local artists and school programs, and (hopefully) WIN BIG! Tickets are on sale now! A complete list of prizes and silent auction items is available here. New for this year, we also have Reserved Tables and Corporate Sponsorship packages. A portion of all ticket sales are tax deductible. Proceeds benefit Cheshire Moon Inc. and will support our Dancescape, Dancescape Ed, and art and music education programs.